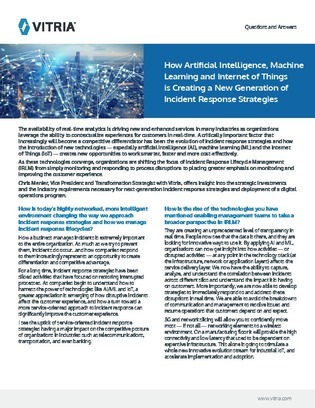 As artificial intelligence, machine learning and the Internet of Thing converge; organizations are shifting the focus of incident response lifecycle management (IRLM) to place greater emphasis on monitoring and improving the customer experience. In this Q&A, Chris Menier, Vice President and Transformation Strategist with Vitra, offers insight into the strategic investments and the industry requirements necessary for next-generation incident response strategies and deployment of a digital operations program. How is the rise of different technologies enabling management teams to take a broader perspective in IRLM? Are you seeing examples where organizations are in fact separating themselves from the pack by being early adopters of this shift?